The Atomic Weapons Research Establishment, Orford Ness, Suffolk, was operational between 1956 and 1972. Its primary task was environmental testing to simulate the conditions that nuclear weapons and their components might experience during trials and in service use. 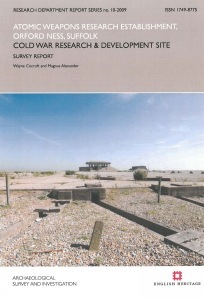 The report is primarily concerned with the development of the post-war Atomic Weapons Research Establishment.